We hope everyone has enjoyed everything Expedition has had going on, between things like the June update featuring some new art from our Sci-Fi expansion and the community-made character sheets. However, some might notice we don't have a writing contest going on in the past month! We decided to give our quest crafters a bit of a break, but we're excited to come back and talk about the next writing contest for Expedition. 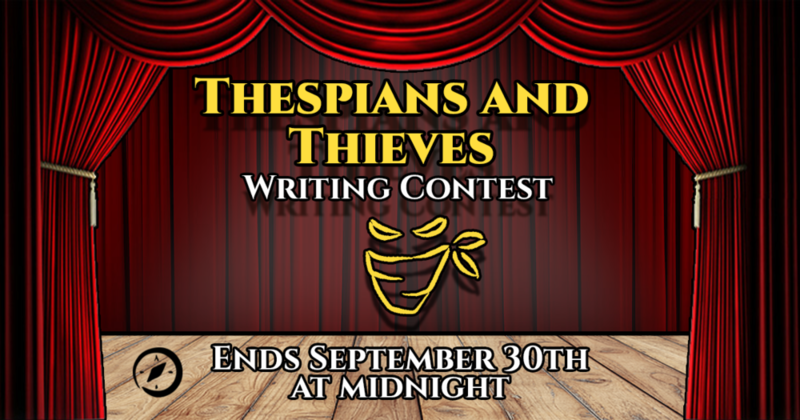 Hopefully everyone's ready to write their best script, as we're ready to pull back the curtain on our next contest... Thespians and Thieves! Someday we won't force those awful puns, but today is not that day! Thespians and Thieves will see the return of our dual-theme system, but one might notice, this contest will take place over two months instead of the usual one. The themes for this contest will be bandits and drama. In other words, we want to see you publish the best quest you can using bandit enemies, a drama-filled plot, or both if you're up for a challenge. This contest will run until September 30th at 11:59 (EST). The winner of Thespians and Thieves will earn 500 loot points. All entries will be rewarded with 100 points for using either theme, or 200 points upon using both. Create your quest and upload it by September 30th, 11:59 PM (EST). Fill out the Google Form with your name and quest title. If you're looking for some tips on creating quests, check out our Quest Crafter series and consider subscribing to our Quest Crafter newsletter. Make sure to follow our Facebook, Twitter, and Instagram pages for the latest updates, and join our community on Reddit for the latest announcements! Time to write your best screenplay, adventurers. Break a leg! Expedition: The Future launches on Kickstarter on October 2nd!